Now picture that with the DCU, JLA or Legion of Super-Heroes! Sure desktop wallpapers aren't a great money spinner, but pretty soon even a Dr. Druid solo series could start being 'worth a shot' if you are trapped in front of him for the whole 9-5 workday stretch. 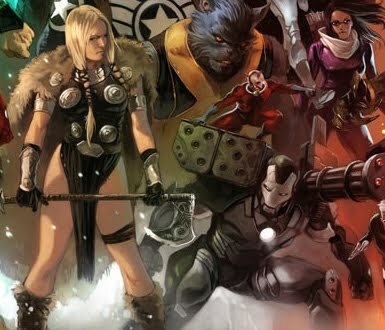 And while I'm on it, here's proof from the pic why of all the 'Earths Mightiest' titles Secret Avengers should be the one to place your bets on; an Asgardian warrior woman, a 'beast-man, and Ant-Man riding one of War Machine's rocket-launchers. How freakin' cool is that? oh man this fantasy painting style illustration is exactly the sort of thing i need to do for that Suicide Squad blog we've been talking about Dan. but just not with so many characters otherwise i'll be collecting my social security before i get it done. Yeah Marko's done some awesome group shots alright David! Click on his tag and have a scope round... you'll like what you see!